It’s the second Monday of the year, time for another Inspirational Monday! 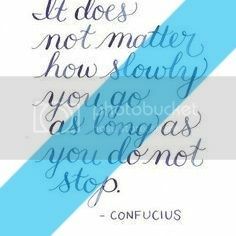 Today’s Inspirational Monday is about not putting too much pressure on yourselves, it doesn’t matter how long you take o get somewhere. I too am guilty of putting too much pressure on myself, I always think that everyone else is way further than what I am, that they’re already where they want to be or are further ahead than me. But the thing is, everyone has their own story, their own path to walk. Why compare ourselves to someone else, if their life is not ours? If you know where you want to go, keep going. Don’t stop. It doesn’t matter if you go faster or slower than someone else, the important is that you don’t give up, keep going and one day reach your purpose. Be true to yourself and never stop going!